East Valley Life: Hey KMart? Are you listening? Hey KMart? Are you listening? Yes KMart - here is yet another incident of your famous exploding Martha Stewart tables that you've been ignoring for years. This time it was in my backyard. At 5:45 am this morning it was overcast and cool, kind of rare for the Arizona desert at this time of year. The sun was just beginning to peek through the clouds. After returning from outside to feed our hens I had just sat down on the couch when I heard a commotion in the backyard. I've only heard my chickens freaking out like this when danger was approaching, usually in the form of a stray cat or fireworks. I scanned the yard to check on the cause of their upset and whoa! A shattered glass mess under what used to be our fabulous outdoor table with a built in lazy Susan. It was your Martha Stewart table exploding that caused our flock to start screeching. Thankfully they were 30 feet away and not hit by any flying glass. I'm not stupid. I did my homework. 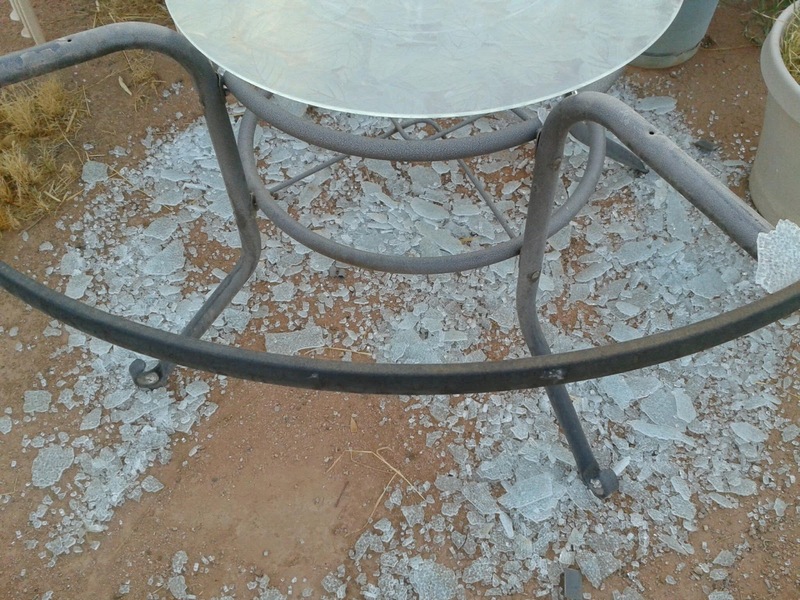 I know this isn't the first time this has happened with your Martha Stewart patio furniture and kitchen tables. Heck, it's not even in the first hundred incidents. Google lists many articles, incidents and several videos. I know you've been sued, I know that people have demanded for several years that you recall these tables, but you keep ignoring the problem. Here is my dilemma. I think you should compensate me with at least a coupon for 50% off one of your new and improved outdoor tables. I'm not asking for a new one at your expense, the table was in excellent condition but it was several years old, obviously. Still, since it was in excellent condition, we expected to get many more years of use out of it. I will be happy with a very good discount to replace my used table that had a bad design flaw you've been ignoring. If you can't help me with that, I may need to start shopping elsewhere. If you want to know how much I shop in your store I will be happy to send you the number on my rewards card. That way you'll know exactly how much you will be losing if I decline to return to your store. Honestly, I love KMart. Your employees are wonderful at your Lindsay and Main location here in Mesa, AZ. When I check out, they not only thank me for shopping there, they say "Thank you for shopping with us and keeping us open." And they mean it! They keep the store clean and stocked and they are always helpful. You have the best sales on the paper goods, toiletries, and cleaning products that we use, and it is the only place I buy our socks, t-shirts, undies, etc. You get the picture. I am 48 years old. No joke- I have been shopping at this KMart location since I was 15 years old and new to Arizona. I've been a loyal customer for 33 years and I hope that means something to you. So please don't let me down. Are you listening KMart?